Loss comes in many forms: The grief over the death of a loved one, the devastation of a physical or mental impairment, the pain of divorce or separation, or the distress of job loss and foreclosure. The physical and emotional responses to grief can be as heart wrenching as the loss itself. So where does a person turn for answers and encouragement in a time of despair, doubt or fear? Through a Lens Darkly: Grief, Loss and C.S. Lewis will uplift the soul with moving stories of individuals and families touched by significant loss who have begun their journey to recovery, and who share their thoughts on the timeless wisdom of C.S. Lewis's most personal and reflective book, A Grief Observed. This literary review offers real-life examples to help viewers begin to recognize and cope with the many emotions and seasons of their own grief and identify the best approaches to help others through the grieving process. Grief doesn't have to feel like fear anymore. Anyone facing personal devastation can find a path to healing and hope in this inspirational and informative film. - Did God give each person free will? - Can good truly overcome evil? Consider these questions and more as we journey inside the mind of C.S. Lewis in this introductory review of one of the great Christian literary works of the 20th century. The Screwtape Letters, a thin volume of imaginative letters between two devils, has given millions of readers insight into conquering everyday spiritual struggles. Join us as we explore the Biblical, historical and cultural depictions of Satan and hell and gain a deeper understanding of the nature of temptation and redemption. Whether you're a devoted C.S. Lewis fan or just reading his work for the first time, you're sure to develop a new appreciation for The Screwtape Letters through this modern look at his timeless classic. This DVD can be viewed as a documentary or as a five-part study for small groups. He cried out, "Where is God when I really need him?" This film is about the agonizing spiritual crisis of C. S. Lewis when his wife died from cancer. The love, grief, pain, and sorrow were so shattering to Lewis that his basic Christian beliefs, magnificently communicated in his many books, were now called into serious doubt. Relive the journey of C. S. Lewis during the days prior to and after the cancer-related death of his wife Joy in this film that captures both heart and mind. You will be able to see his commitment to Christ despite severe trials. He picked up the pieces and moved out of the depressing "shadowlands," realizing that "real life has not even begun yet." Starring Joss Ackland and Claire Bloom. Winner of over a dozen prestigious awards including the International Emmy for Best Drama and two British Academy Awards. Includes 90-minute television version and 73-minute abridged version. Prepare to enter another world as Walt Disney Pictures and Walden Media present C.S. Lewis' timeless and beloved adventure. With stunningly realistic special effects, you'll experience the exploits of Lucy, Edmund, Susan, and Peter, four siblings who find the world of Narnia through a magical wardrobe while playing a game of hide-and-seek at the country estate of a mysterious professor. Once there, the children discover a charming, once peaceful land inhabited by talking beasts, dwarfs, fauns, centaurs, and giants that has been turned into a world of eternal winter by the evil White Witch, Jadis. Aided by the wise and magnificent lion, Aslan, the children lead Narnia into a spectacular, climactic battle to be free of the Witch's glacial powers forever! Readers and movie fans worldwide know the land of Narnia and the magical beings who dwell there. But few know the genius who created this beloved fantasy. Now meet C.S. Lewis, an extraordinary creative force, in this engaging biography, filmed in Oxford, England where he lived, worked and imagined "The Lion, The Witch and the Wardrobe," "The Magician's Nephew" and the other tales that make up the beloved "Chronicles of Narnia." Starring Anton Rodgers. In this revealing look at the life of C. S. Lewis, go behind the scenes to see the sites he knew so well, and to meet those who knew Lewis personally. C. S. Lewis is remembered as a scholar, teacher, and writer. He's also been called one of the most influential spokesmen for the Christian faith in the the 20th century. 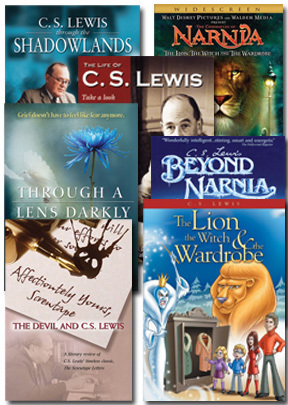 During his 30 years at Oxford University, Lewis produced a number of Best selling books that are still widely read today, including The Chronicles of Narnia, and Mere Christianity. This 4-part video from Day of Discovery The Life of C. S. Lewis explores how Lewis changed from an outspoken opponent of Christianity to one of its most powerful defenders. Trace the depth of spirit and the breadth of mind that led to his worldwide influence and see what new challenges and changes came during the last decade of his life. This original animated version of C. S. Lewis' classic is an Emmy Award-winning program and a delightful visual telling of the Lewis allegory. The death and resurrection of Aslan the Lion invite comparison with the Biblical accounts of Christ’s death and resurrection. From Children's Television Workshop.